After a disappointing first half the Blues Academy got their act together and beat Moseley convincingly by 33 points to nil at Moseley’s Billesley Common ground. The Blues started the first half with an unforced error, taking the kick-off with two players in front of the ball and gifting an attacking scrum for Moseley on halfway. With Bedford never able to establish a platform up front, and Moseley disrupting the Blues’ continuity, it was a scrappy half with neither side looking dangerous in attack. Bedford managed to play some rugby in the last few minutes of the half and created a well worked try when a break from centre Harry Hutchins was taken on by full-back Jack Gibbs and winger Ryan Hutler who fed centre Aaron Martin for a try. The conversion was missed and Bedford were 5-0 ahead at half time. Bedford adopted a more direct approach in the second half, reduced the error count, and began to put together some good phases of rugby. From a scrum in their own 22, Martin made a break and fed Hutler for a try; fly-half Liam Shields converted and the Blues were 12 points ahead. 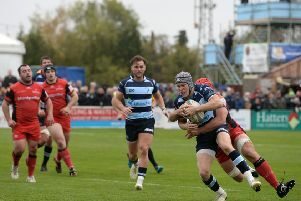 Bedford began to increase the pressure on Moseley and, from a Blues scrum in the Moseley half, a well-worked move saw the backline create space for full-back Max Titchener to hit the line at pace and score; Hutchins converted. Bedford increased the tempo of the game and, from a break in their own half, props Leon Patel-Champion and Olly Pescott-Frost drove the ball deep. A quick ruck was won and number 8 Rahat Choudray put flanker JonJo Fanning in for a try, converted by Hutchins. Bedford’s final score was simple and well executed; a Blues scrum, a short delayed pass from Hutchins, and centre Paul Aguele hit the line hard for a try under the posts. Hutchins converted and the Blues secured the 33-0 win. The Blues Academy are next at home on Saturday, September 26, when they take on the RAF U23 XV, kick-off 3pm. Speaking after the Moseley game, Blues Academy director Denis Ormesher, said: “We were poor in the first half. With a series of unforced errors and poor discipline, which gifted penalties to Moseley allowing them to relieve pressure, we never established any continuity. “The second half performance was much better. We reduced the errors, improved the discipline, and began to play a simple, more direct, game. “Some of the tries we created were very well executed, and our fitness allowed us to increase the tempo, when Moseley were weakening in the second half. “Our defence was good through the whole game, and even in the first half, when were created little in attack, the defence was solid. “We were pleased with the younger players who made their debuts, and the way they played today will put real pressure for places on some of the more experienced players.